Martin's latest exhibition, Stilled Life featured a series of works that permitted the viewer to engage in casual voyeurism. Scenes from everyday life took on a cinematic quality, when lit from within. As part of the Archibald Prize touring exhibition, the Mornington Peninsula Regional Gallery hosted a series of conversations with a selection of finalists. Here, artists Phillip Barnes, James Powditch and Martin Tighe are talking about celebrity portraits with Vivien Gaston. Vivian Gaston, Martin Tighe, James Powditch and Phillip Barnes discuss celebrities and painting. Image courtesy MPRG facebook page. Martin's exhibition Work of Human Hands opened on September 4 at Hogan Gallery in Smith Street, Collingwood. Opening remarks were made by Campbell Thompson who stood in a very short notice for John Farnan, Director of Zeally Bay Bakery. An excellent night and opening event. Normally ABC Classic FM’s Emma Ayres is the interviewer. Here she is the subject. Broadcaster Richard Morecroft interviews Emma Ayres along with Martin Tighe, who painted her Archibald Prize 2014 portrait. With Fiona Lowry announced as the winner of this year’s Archibald Prize and the circus moving on, we thought it would be fun to play Six Degrees of Archibald, finding links between six of this year’s Archibald finalists. 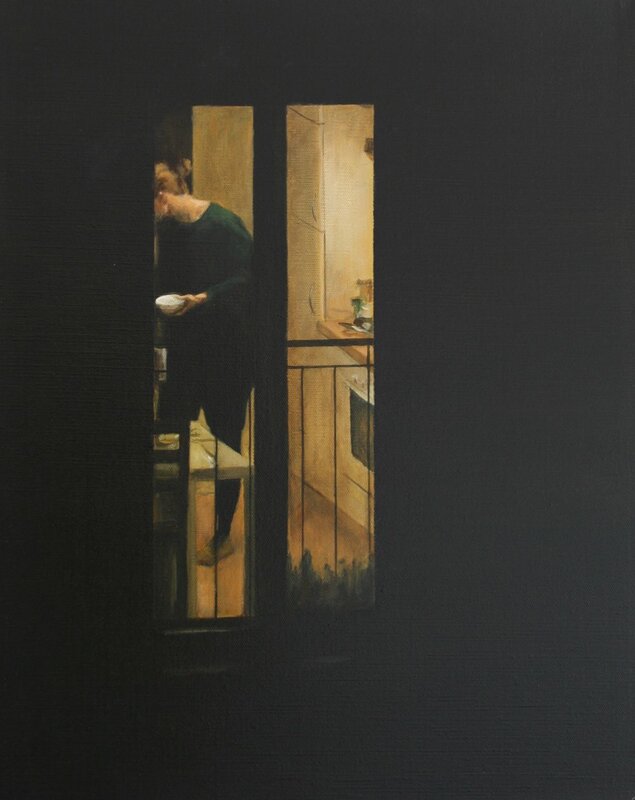 Martin Tighe's painting Return to Sender was selected as a finalist in this year's prize competition. ‘It’s difficult to know yourself,’ wrote van Gogh in one of his many letters, ‘but it isn’t easy to paint yourself either.’ Yet artists keep doing it, whatever the dictates of fashion or their times. The artwork is my first self-portrait. I expected that the painting of it would present the same challenges portraits of other people presented. I was surprised to find the experience confronting. The Tattersall's Club Landscape Art Prize, in its twenty-fourth year, remains a highly regarded and sought after invitational award. Seventy-three artists from every state and territory were accepted to participate in 2013, many of which are finalists and winners of the prestigious Archibald, Wynne, Sulman and Moran art awards. Martin Tighe's portrait of writer Gideon Haigh, was selected for exhibition in the Salon des Refusés. This exhibition was initiated by the S.H. Ervin Gallery in 1992 in response to the large number of works entered into the Archibald Prize not selected for hanging in the official exhibition. 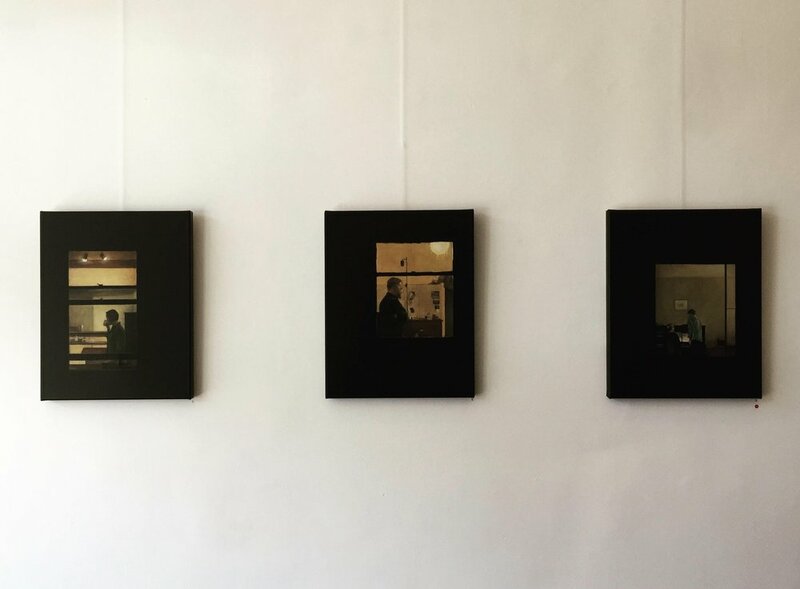 The Salon des Refusés exhibition at the S.H. 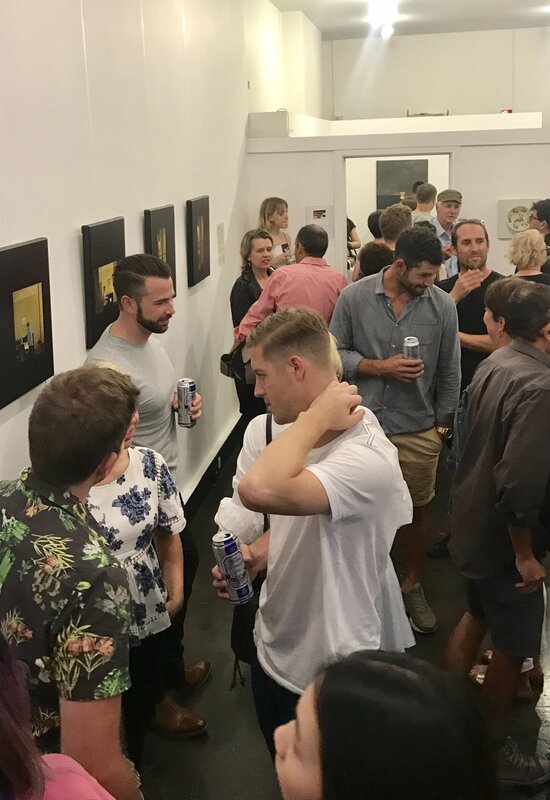 Ervin Gallery has established an excellent reputation that rivals the selections of the ‘official’ prize exhibition and is often cited as a more lively and discerning selection. TOM WILLS appeals to Martin Tighe as an outsider with a dark side. They're a good fit - the artist who often paints sport, but is more interested in the landscape on which it sits, and the sporting figure whose legacy is about more than ball games. Martin Tighe at the exhibition of his work. He once taught at Coburg High and could hear muffled announcements to prisoners at Pentridge in a northerly wind. He could clearly see the bluestone D Division where Ronald Ryan was the last man in Australia to be hanged, almost 40 years ago. In every sporting contest, there is at least one loser. In team sports, there are many losers at a time. In races, there are more losers than winners. This concept of defeat, at once cruel and inevitable, fascinates artist Martin Tighe, who has turned it into a series of paintings and now a sculpture. "I'm particularly interested in defeat. It's a richer field, a more complex emotion," Tighe said this week. "Winning is a simple emotion." Artists provide us with images that define the time and place we live in. Working in distinctly different styles, from disparate points of cultural and social origin, and from widespread geographic locations, the artists associated with this project have each responded in very personal ways to what they feel is the spirit of football. You and I may not see anything in a rusty, discoloured, warped piece of flat iron lying in a paddock. Artist Martin Tighe however, see it as a painted canvas. He was so excited by the find last September – an idea was germinating in his head – that he brought the piece back with him, along with a few wheat ears, to Melbourne to work on. The result is 12 artworks using flat iron and wheat described as landscape compositions and entitled Wheat Fields.